The air that Americans breathe is racially charged. 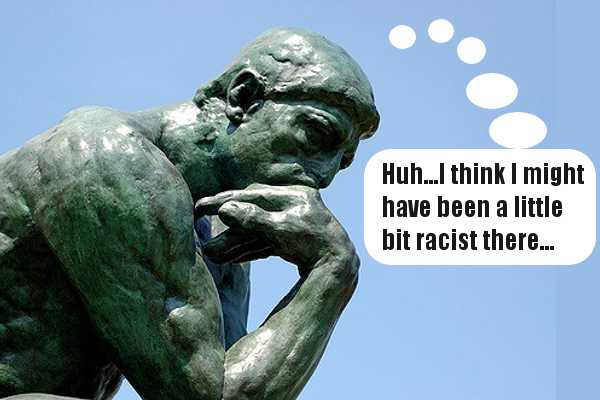 Whether we care to admit it or not, we have been acculturated for four-hundred years to be racist. Asking Americans to exorcise the racism etched into the bedrock of our culture is like trying to take the cocoa powder out of a brownie. Yet that’s part of the path which anyone who is committed to personal growth in this society must walk. It’s also the task of progressive social movements which are no more immune to ingrained racism than the people who populate them. Pamela Boyce Simms, Convener of the Mid-Atlantic Transition Hub (MATH) joined Ajowa Nzinga Afateyo and Josh Davis of the Grassroots Economic Organizing (GEO) Collective for a discussion of how the worker’s cooperative and the Transition environmental movements are working with this perpetual issue – and how we're not. Pamela and Ajowa, both of whom were drawn to their respective movements as a function of their spiritual paths, had reached some shared conclusions. Both view pursuit of self-acceptance, self-knowledge, and introspection as antidotes to social movements being sucked into the gaping maw of the omnipresent American racial vortex. Collective adoption of some process of ongoing self-examination and transformation as a group norm offers movements a glimmer of hope. Worker cooperative movements and truly grassroots, citizen-led environmental movements share the common DNA of democratization of power. GEO calls it “creating cooperative culture.” The Mid-Atlantic Transition Hub (MATH) calls it the “Great Transition,” toward a regenerative lifestyle which nurtures all; including the Earth. Translating that DNA from a tenet to which a movement aspires into an ongoing, boots on the ground reality is a perpetual challenge. American structural racism makes true egalitarian democratization of power a monumental challenge because whites are not socialized to see people of color as their true equals. Legislated proximity aside, de facto egalitarianism simply does not compute. The natural assumption tends to be that the white guy who projects that he’s the smartest person in the room and knows what’s best for the co-op or environmental initiative is pivotal to success. It’s so irresistible. It’s the reflexive American norm to which we default. Our discussion focused on the “white liberal savior complex,” a particularly insidious manifestation of structural racism. The savior complex is more dangerous than sheet-wearing, cross-burning, drag-you-behind-a-truck racism because it facilitates white feel good, self-delusion and often entrances people of color. The savior extends kindness, generosity, and charity to those objectified as pitiable “others,” who are assumed to need the white/privileged experts to show them the way. The white savior rescues the “under-privileged” from circumstances and forces that whites have put in motion, from which the saviors benefit, and which they unwittingly, or deliberately perpetuate. And the circular beat goes on. Predominantly white liberal social and environmental movements wonder why it is difficult to attract and retain significant numbers of African Americans for the long haul work! Pamela noted that the Transition environmental movement has tried unsuccessfully for ten years since its inception to involve African Americans. GEO has raised concerns about the implications of top-down, white professional-led co-op development in low-income Black communities. Ajowa recalled that her suggestion to cooperative colleagues that they explore racism within the movement was met with deafening silence. It’s much easier to fight for equality and call out someone else’s overtly racist behavior than to look in the mirror at how racism is subtly interwoven into the fabric of one’s own identity. It was noted that the savior complex goes deeper than race. It’s a pathology. The white savior’s intense need to be needed, (to help, rescue, save) stems from an inordinate need for affirmation, approval and control. Any sentient being who fits the “worse off than I,” description will work for the savior’s purposes. These are deep patterns to deconstruct! Attracting, truly valuing as equal, and preventing attrition of people of color in white dominated movements will not magically happen by osmosis. Given the current American racial climate, people of color are fed up. These days, for every Black person who gladly accepts the white savior activist’s charity-with-strings, there are five of us who refuse to subject ourselves to the incessant, spirit-eroding racial microaggressions; even in the most well-intentioned white liberal movement forums. There is hope. One of the few positive things that decades of diversity, sensitivity, and cultural competency workshops have unearthed is the fact that whites need to work out their racist baggage among themselves. People of color invariably suffer all manner of retraumatization when participating in racial dynamics discussion forums with whites. Pamela pointed out that there are two contemplative traditions, namely the Quakers and some Buddhist groups as cases in point, in which whites openly declare their racist acculturation and work to deconstruct it together. Quaker “White Privilege Conferences” and Insight (vipassana) Meditation “White Awake” groups routinely convene practitioners to take up this challenging work from a place of introspection. Our discussion concluded with the observation that progressive social movements would be wise to read a page from the playbook of contemplative traditions whose white practitioners squarely face, and own the need to deconstruct their own racism. Integrating ongoing self-observation and critique as a norm would be a great starting point. Developing and then heeding what emerges from feedback loops around internal racial dynamics is an authentic move. This involves getting comfortable with discomfort. Learning to truly appreciate the often excruciating process of uprooting the filigree threads of racism within ourselves, i.e., taking the cocoa powder out of the American brownie is a deeply rewarding, but acquired taste.